Mounting geopolitical risk adds to earnings uncertainty. Half of finance executives say their companies face greater risks in general now than three years ago: AFP study. On the eve of the Trump inauguration, geopolitical risks, shaped in large part by the U.S. elections, could have a greater impact on earnings than they did previously, according to research by the Association for Financial Professionals. In the 2017 AFP Risk Survey, which polled 480 finance professionals, 89% said their companies’ exposure to earnings uncertainty — taking all risk factors into account — has not improved from three years ago. Almost half (49%) said their companies face greater risk now. In AFP’s 2014 survey, only 43% said they faced greater risks than three years earlier. Geopolitical risk, while cited as a concern by only 19% of survey respondents, has gained more attention in recent months, according to the association. Forty-six percent of companies polled say their executives are now taking geopolitical risks into account when making decisions. “Boards and C-suite are taking geopolitical risks into consideration when they look at strategy and risk management,” says Craig Martin, AFP’s director of executive programs. Companies are paying attention to such risks more than they were even a year ago, he notes. Even though political risks are somewhat “intangible,” Martin notes, they still ranked in the top 10 concerns in AFP’s survey results, partly because they are notoriously hard to plan for and can severely impact an organization’s earnings. But companies aren’t standing idly by. A majority of them have reduced the potential impacts of political risk by staying agile. Sixty percent of those polled said they have taken actions to maintain adequate liquidity in the event of unforeseen obstacles. Companies are also ensuring their balance sheets are sound (38%) and reexamining their currency exposures (38%). “As much as [companies] plan for external competition, it is very difficult to plan for the unexpected geopolitical event or crisis which can severely impact an organization’s earnings,” Kaitz said. Although boards and executives are taking more notice of political risk, forecasting in general continues to be as promising as peering into a crystal ball, according to respondents. Eighty-four percent of them said forecasting has not gotten any easier in the past three years, and 36% said it has become more difficult. That was up from 34% in last year’s survey and up five percentage points from two years ago. More than half (51%) of participants predicted forecasting will only get harder over the next three years. Asked what risk factors are expected to impact earnings over the next three years, 40% pointed to tougher competition (see chart), which took the second spot in each of AFP’s previous two annual risk surveys. Customer satisfaction and retention (33%) was the next-most-cited concern this year, while political and regulatory uncertainty (32%) fell from the first spot a year ago to third in the new survey. A majority of risks addressed in the survey were either “financial factors” like credit, liquidity, interest rates, and currency, or such “business and operations” concerns as supply-chain disruptions, production interruptions, litigation, and labor. Among five broad categories of risks, financial and business/operational risk were the biggest driving factors of uncertainty, both cited by 24% of respondents. Surprisingly, cybersecurity ranked only 15th on the risk list. Only 13% of respondents indicated cybersecurity as a concern. 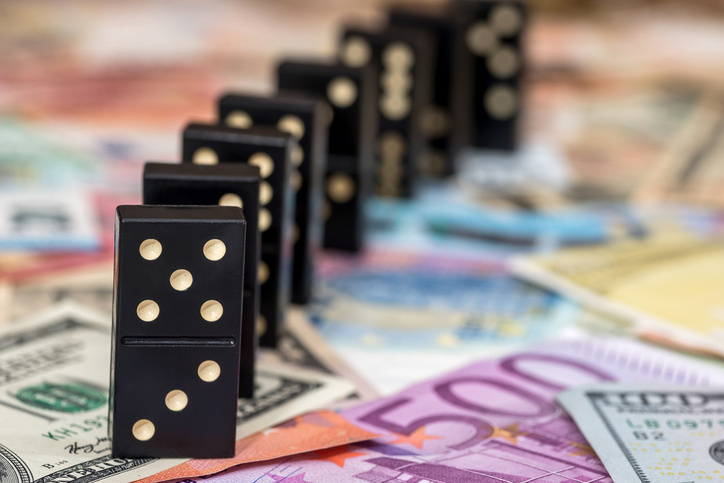 “Given the rise in geopolitical instability and other global risks … leaders and treasurers must focus on helping their organizations understand the potential impact of uncertain events on business strategies, operations, and supply chains,” said Alex Wittenberg, executive director of the Marsh & McLennan Global Risk Center, in a release. With more on the line, a slight majority of business leaders from larger organizations (annual revenues of $1 billion or more) and those from publicly owned companies reported anxiety. The 480 finance professionals were polled in September 2016 and held job titles of CFO, treasurer, controller, vice president of finance, and assistant treasurer.